Cheap wedding bouquets don't just have to be about flowers, more and more brides are looking for creative ways to be unique. 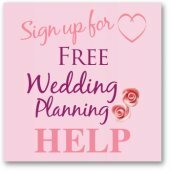 These are main stream brides, having fun making their own wedding really unique! There is an increasing display of unusual bridal bouquets that have really caught the imagination of brides today and the great thing is they can be a lot cheaper than a standard hand tied bouquet of flowers. Brooches are hugely fashionable at the moment for wedding favors and also for wedding bouquets. This is a trend that keeps growing and you can tell that just by looking at the listing of brooches on Ebay and how quickly they are being snapped up. To make your own brooch bouquet you will need brooches, wire, pliers, tape and ribbon. 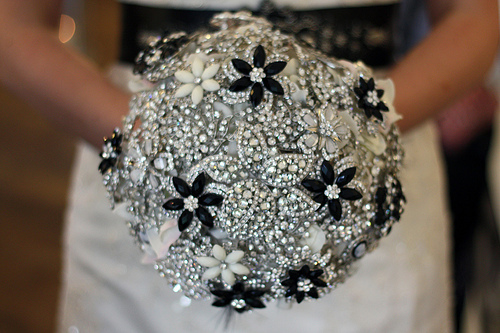 Ask your family and friends if they have brooches that you can borrow or have for your bridal bouquet. 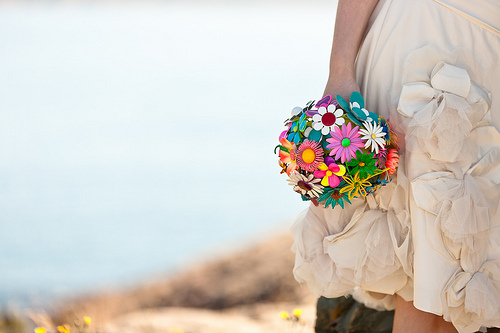 You could have an overall color for your bouquet or go for the most bling! If you need to buy the brooches have a look at those available on Ebay or flea markets and garage sales. The most popular brooches for bouquets are flowers but any will work. The easiest ones to work into a bouquet are mainly round ones. Start by cutting a length of wire that is double the length of your bouquet, plus a bit extra. This way you have some room for error! Take your first brooch and make sure it is done up at the back. Thread your wire through the back pin, and when you have the brooch at the half way point on the wire, twist the wire so that you secure the brooch at that point. Bring both ends of the wire down and twist together to form a stem. Repeat this for every brooch. Take all of the brooches and create a bouquet that you are happy with. Tape all the stems together and then wrap the ribbon around the stems to create a stunning cheap wedding bouquet. If you have enough brooches you could create sparkly cheap wedding bouquets for all of your bridesmaids too. 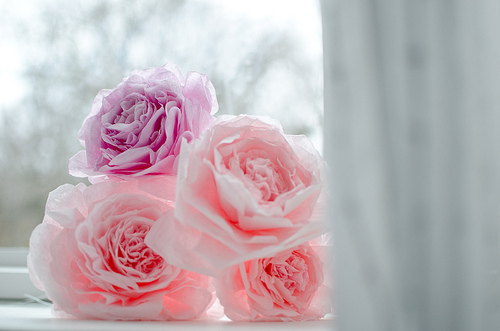 Another bridal bouquet trend that has grown is to use paper flowers. You could make them out of tissue paper and have a pompom type effect or thicker colored paper and you could even use pages from a book! 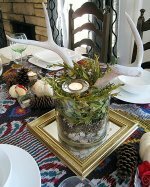 For tissue paper flowers you will need tissue paper, wire or pipe cleaners and ribbon. Fold the tissue paper into a concertina or fan. When you have completed the fold take a pipe cleaner and wrap it around the middle. Cut the ends of the concertina into petal rounds and then slowly and carefully pull the tissue paper apart. Do this until you have enough flowers and then tape the stems together and wrap the stems with ribbon. You could have smaller bouquets for your bridesmaids and pompoms for your flower girls. For the pompoms just tie a ribbon from the middle to be held. 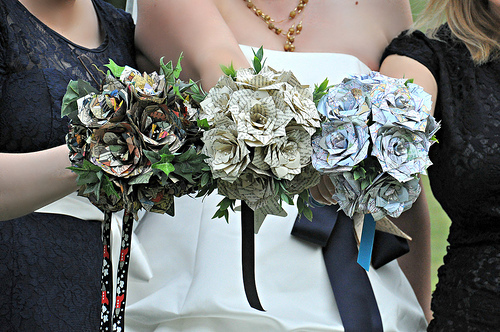 If you wanted to use more substantial paper then I have seen a number of brides using paper from books. This can be very personal to you both if you choose a book that means something to you. College professors watch out for petals cut out of their text books! Origami is a great way to create paper flowers and they look very professional once you get the hang of it! This could be one of those craft activities where you get all of your girlfriends together and get making! 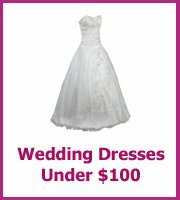 You could make enough cheap wedding bouquets for everyone! One warning note for paper bouquets - don't use them in rainy weather!! 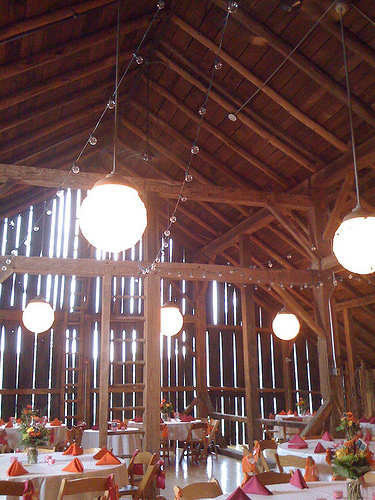 This is a real upcycled wedding idea! You can create the flowers from material and buttons as the center. You will need material, buttons, wire, ribbon. Cut the material into basic flower shapes. You will want different sizes so that you can layer them on top of each other. Create one flower by placing the material on top of each other and then sew a button into the center to secure all the layers. Then take a piece of wire and thread it through the holes in the button and bring it down into a stem. Repeat this until you have enough flowers and then tape all the stems together to make a bouquet. Wrap ribbon around the stem for the finishing touch! You can also make your bouquets just out of buttons on wire. They look stunning and are quite heavy so don't make them too large! You can see that brides are creating their bouquets out of all sorts of interesting items. Most have flowers that look like flowers whatever the material is that they have used and just by looking around at home you could create some interesting bouquets. Some ideas could be plastic bottles, tin cans, leather, balls, canvas and even rugs. You will need to play around with the materials to find what works for you but just think about how unique your bouquet will be. And you could end up saving a fortune!